My queen shipment has arrived, and I will start making nucs tomorrow. The first post in A Tale of Two Nucs will follow shortly. As I mentioned earlier, this series will begin with the making of two nucs and will follow them until they are established. 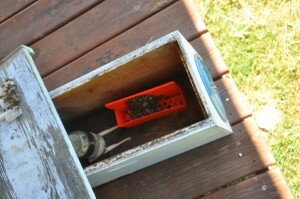 For new beekeepers, think of a nuc as a starter hive, set up with several frames taken from an existing hive. These frames contain drawn comb with bees, pupae (final stage of developing bees), honey, and pollen – a bit of everything a colony needs, except a queen. She is added separately, usually in a queen cage. My queens arrived in a device called a battery, a method used for shipping several at a time, usually 15 or more. The queen cages, either wood or plastic, are the same as for queens shipped individually. The difference is in the attendant bees. In a battery, there are no attendants in the cages, each of which contains a solitary queen. The queen cages are placed in a cardboard box (typical if the queen cages are wood) or in a plastic container (if the cages are plastic), and the attendant bees (from 25 to 100, depending on the number of queens in the shipment) are in outer containers, or battery boxes. A piece of sponge soaked in sugar syrup provides a food source for the bees during shipping. The attendants care for all the queens, meaning that they feed them and cluster around them to keep them warm. It’s as if they think, “We don’t have a queen, one of you will become our queen, so we’ll care for all of you until one emerges from her cage”. This behavior is similar to that exhibited when honey bees care for a large number of queen cells. Queens shipped by this method arrive in better condition, and stay healthy for longer periods, than queens shipped individually with attendants inside the cages. The latter should be installed in hives very soon after arrival (within 2 or 3 days); queens in batteries may be held for up to two weeks, though I prefer a week or less. 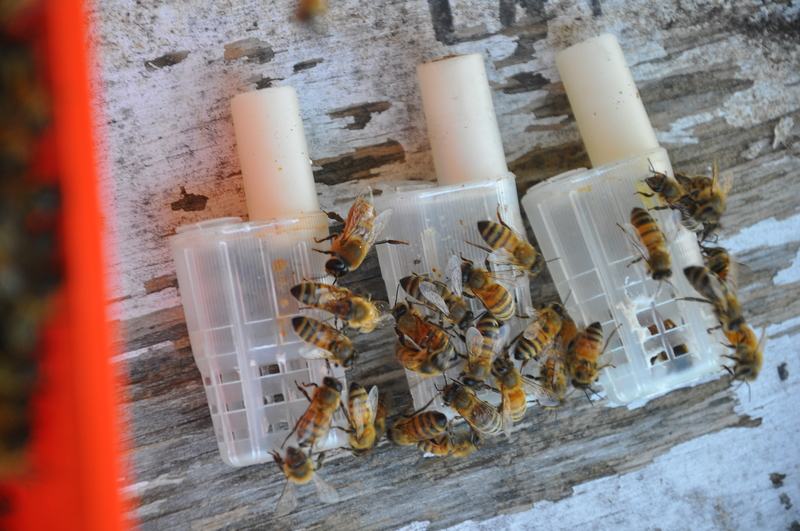 When I receive a battery of queens and don’t plan to install them immediately, I open the battery box to allow the attendants to fly (preferably outside.) 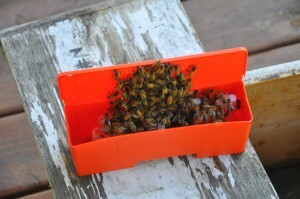 I like to set it inside an empty nuc box and place a glass feeder jar inside with it. The attendants are free to fly, defecate, and gather nectar, with the syrup in the feeder as a backup food source if necessary. 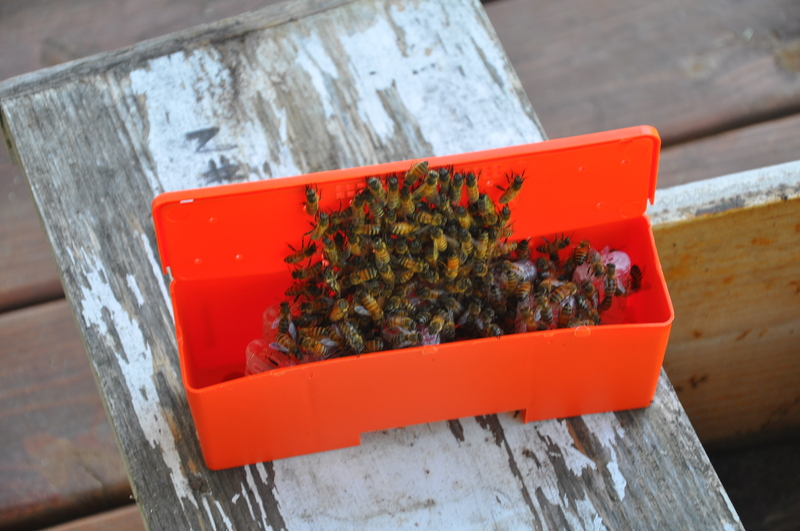 Normally, I leave the nuc box on our front porch (my family is used to bees flying around) and bring it inside the house in the evening (after closing the entrance of the nuc box) if the nights are cool. As you can see from my photos, this battery does not contain 15 queens. I usually go together with several friends to place an order for 50 or more queens at a time and, when they arrive, I move mine into a smaller battery box. I encourage local beekeeping associations to place similar joint orders. In addition to saving money and getting healthier queens, bulk ordering enables beekeepers to take advantage of express shipping. Batteries are typically shipped via overnight express, which costs about $35 per order. This expense is not practical for just a few queens, but spread amongst 50, it is economical. For orders from distant suppliers, such as those in California or Hawaii, express shipping is the only practical method. Next post: making the nucs.